A year ago I had the privilege to write an article in this advent calender on the 24th December. This year I couldn’t agree before to write an article due to my job, yet recently I found some time – but lacked a topic. Last year’s article was a potpourri of different drills for different parts of a session with variations we have done before in the U18 (and we still do at the pro level), yet with a focus on drills I haven’t seen anywhere before. For this article I discussed with the guys from Konzeptfussball which topic I should cover: Somewhat hard aspects of the game to train (outplaying in underload in the last third, coverage while in possession, depth variations in 2nd third), more innovative topics (positional rotations, a different build up or pressing strategy) or just the most interesting drills? Heck, I even thought about doing a „best funny drills or fun tweaks for drills“ for the 25th! But instead I wanted to share something I realized, mainly in the last two years. I guess most people don’t know that I started as youth coach, even before my work on Spielverlagerung and as analyst for different clubs. From the very small youth teams in my home town I got up to being head coach of the adult amateur team before leaving for Red Bull Salzburg. In this time frame (2010 to 2017) I had teams with very distinct styles – a very dribble and counterpressing oriented youth team, a very possession based amateur team and obviously our U18 and our Youth League team which were rather classical RB teams in three of the four phases of the game with a somewhat positional tweak on the possession phase. But looking at how we created and conceded chances, mixed together with a much bigger focus on individual player work and talks with some very knowledgeable people in Red Bull (especially the coaching staff from the academy teams) but also outside (for instance Marcel Lucassen from Raymond Verheijen’s World Football Academy or even some brilliant Spielverlagerung readers like Pablo Rodriguez or Moritz Kossmann and collegues like Mario Despotovic from Hajduk Split) helped me to develop somewhat and learn from different styles, different perspectives. 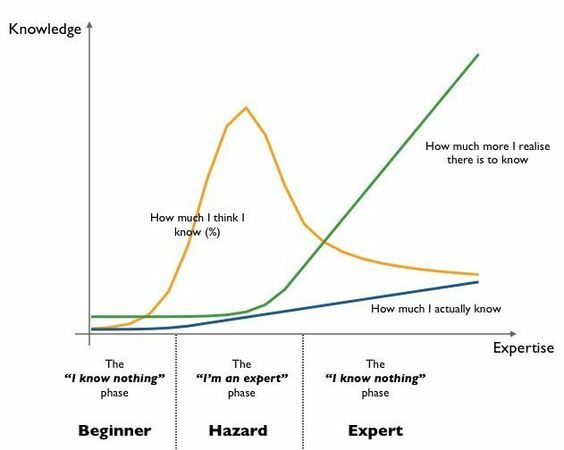 Add to that my Psychology MSc I finished recently and other work (statistical analysts, different sports or just general books on decision psychology, game theory, behavioral economics and rationality) I tried to merge with football and et voilà: I later than sooner realized that I am an idiot. Why? Because I could have done so much better. I could have gathered knowledge better, reflected it better, used it better. Some things I realized fairly early on – talking and bonding with players is always different than between experts (action language vs. concept language) for instance. Other things it took me long, perhaps too long. This is a very basic example of what I got wrong for quite some time. Different styles aren’t created by different football, but by cultures, coaches and players. So why does it matter? Especially for this article and for the topic of the advent calendar? Because it has a very big implication for football theory and football coaching. The drills are only part of a training. The context (atmosphere, results, mistakes in the last games) is also very important, as is the accurate recognition and adequate coaching (incl. wording and body language). A mistake I made – especially on youth level – was the lack of structure in my coaching. I wanted to coach it all and do it in my way. This, by the way, is one of the advantages of a coherent club philosophy. You don’t only develop a style that goes through the different age groups. 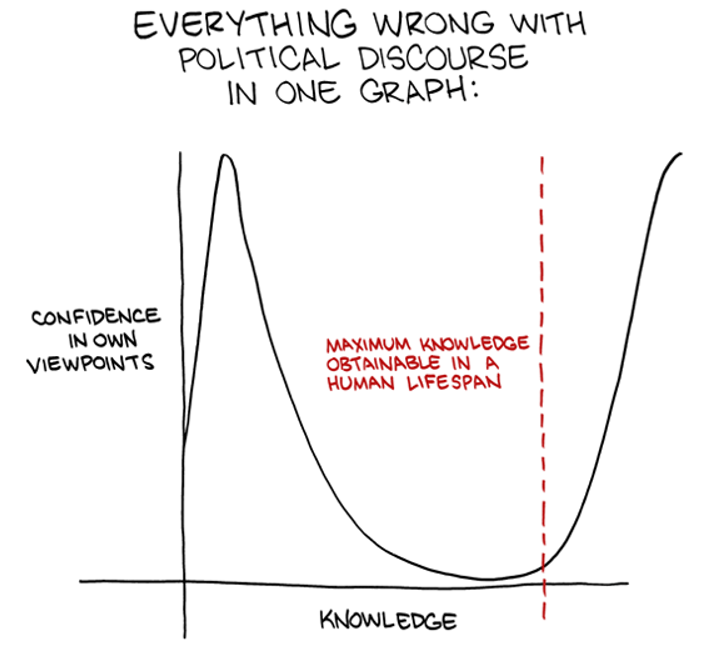 People only talk about the superficial base aspects of a philosophy. But the true thing is: You create details. Details in training methodology, in coaching, in tactical aspects, in wording and in scouting even. I am utterly grateful to Red Bull for that lesson, for instance. The impact of wording for players in coaching on the other hand made me realize what wording in football had on me. Not (just) my own work, but what I have read and what I have grown up with. Zonal and Man Marking for instance are two such things. These metaphors, perhaps, were created to give a picture of what you have to do as a player (the most important thing in coaching, by the way). But once they have become so established and intuitive, that they become the actions themselves. This is not necessarily bad. It also means that the words created are very good. But in the end we should not forget that there is something behind these metaphors, which is important for coaching and especially for individualized support of the player in his development. This is not only a factor for detailled explicit coaching. If you plan a training session with a very implicit focus on developing specific skills, is it easier if you think about the details of the action to plan such a drill and thus heighten the probability for effective learning moments or if you plan a drill where they have to zonal mark? The latter might be more helpful in some circumstances, but in general you want to develop the player to develop the team. Marcel Lucassen for instance once said that football is an individual sport. I’d add it’s an individual sport played in a team and that it applies also out of the pitch, more than ever. Besides that there exist some biases like Hindsight Bias, (Shared) Information Bias, Illusion of Control, Illusion of Transparency, Curse of Knowledge, Functional Fixedness or even the Focussing Effect and Hyperbolic Discounting that can impact coaching and in my opinion apply stronger to coaching with metaphors and generalizations. I’d advise to find good terminology / wording that gets established to give reference for actions. It will help to utilize it in the game and in training, to enhance the probability for a specific variation of a football action and support faster in-training and in-game coaching. Yet, as soon as we forget what’s behind them, it might become a problem. Or would you shout: „Mark the zone! Mark it harder!“? But even if you do, there’d be a question. „22 years ago I started to be a coach. Even I worked with many great coaches and played on, let‘s say a big level, everything was new and (thus) I tried to prepare myself to be ready in every practice for something that I believe is very, very important in our job. If you start with any simple basketball drill and you have your players, they‘ll ask you something. You need to be ready to immediately give the right answer to them. If you don‘t have the right and correct answer, they‘ll understand this and you‘ll have a problem. So this is my suggestion, especially for younger coaches: Prepare yourself before you come to practice. Every kind of drill that you do you must understand why you do it and what you want from this drill. Be ready for the players because they will ask you for details. If you don‘t have the answer: Big problem for you. I have used this quote by basketball coach Željko Obradović in a presentation for Inspire some time ago; back then he was 8 times Euroleague winner with 4 different clubs, now he has added +1 to each. No club has won more (Real Madrid has 9 like him), no other coach has more than 4, no player has more than 7 (Dino Meneghin). This is a tough ask, huh? Let’s simplify it: Don’t we coach our players, give them reference for decision making and try to improve their execution through preparation, through knowing what could happen and through solution trees for questions the game might impose on them? Most coaches and scholars think that this enhances their decision- and solutionmaking through giving them slightly more time, either for their motorical action or/and for their cognitive (as they intertwine mostly both). Wouldn’t this be helpful for us as coaches, too? How well will they be able to perceive the situation? How many solutions will they be able to gather and afford? How well can they execute it? Something I realized: We should prepare ourselves for training through reflection just how we want the players to prepare for the game through training. Even better: We can make implicit things explicit and thus helpful, which both (ability to do so and the helpfulness of it) is not always possible for the players. Now we are (finally!) getting to the point of why I am writing this article at all. The game is the teacher – for coaches as much as for players. Watching how (top) players and teams impose or solve problems in the game (or don’t) and reflecting that is better than most, if not all books about football. Creating concepts from these solutions is then a possibility for generalization, for finding strategies and ideas for team behavior. These become metaphors, concepts, game models. Utilizing some principles from training methodology and about Human Behavior to teach this seems like a fairly logical chain. Deriving complex concepts from simple actions can help a lot in information gathering, just as using concepts with some good explanations and practical evidence. Yet, you’ll always find things that don’t suit the concepts. You’ll find competition, ideas that seem to both work but being disagreeable. How can that be? Obviously the main factor is the variance of the game. Different teams impose different questions, different answers will have more or less success from each other. But in terms of intention for the individual player how much does this make sense? Every player does the same actions. Offensively they try to protect the ball, find a passing option or offer themselves as passing option or support a team mate doing that. Defensively they try to win the ball, intercept passes, block such passing options or cover a team mate doing that. There does not seem more on a „What“-level. Manchester City’s players do the same actions as Stoke’s. Yet, we even can look at the „How“ fairly well, not only the „What“. People familiar with Tamboer’s Football Theory will probably know the Space-Time-Components: The spatial start of an action (position), the temporal start of an action (moment) and the ending of these two created through speed and direction of an action. The „Why“ is what’s different. A technically very good player might afford to hold onto the ball longer with less time and space. A smart player with better perception might be able to earlier and more accurately find the best passing option of his team mates. One coach might demand them to look more into depth for a long ball when looking for a passing option, whereas a second coach will have them search around them in lower distance as he prefers his players to play short ground passes. But how and why does this help with our coaching? As coaches when we plan a game model and/or a training session we should look as much as possible on the individual level, on the improvement and plan accordingly which of the four actions we want to develop in which way. What is the problem of which of the four actions within our model for the players with that function? Urs Siegenthaler from the German FA talked about how using positions less and functions for situations more would be beneficial for the players and the team. Creating such a base, tying it into understandable concepts and create wording for specific variations of the four actions seems useful. I’ll give one example and tie it into a loose idea for coaching points. A word from Spielverlagerung that got used by many in the last years is „Laserpass“. Imagine we think it’s a good metaphor as it’s easy to understand and nice to remember, gives a good association and creates a picture in the brain of the players. What is „to laser“? We want our build up players to bypass lines, we want to have very accurate passes but with high speed so they can not be intercepted and go as deep as possible. The wording „laser“ is decent, although I personally wouldn’t use it in game, but perhaps in video analysis it’s suiting. So from a deep position (lines to bypass and game in front of us) with adequate timing (not too many touches before so the pass stays open, but not directly to not harm accuracy), very high speed (faster than usually to control as there is a good possibility for lay offs in these zones) and into the foot of the team mate (as direction component). In a drill we could easen the pressure on the players in the 1st line and give them clear target players upfront, limit their amount of touches and perhaps do it as an overload before working towards an even game with more pressure applied in the oppositional 1st line. Another way to implement it into training is to look for mistakes or general development goals. We want to teach our young players how to better „protect the ball“. Where is the problem? Perhaps the body is not between opposition and ball (bad position). We could improve the position through explicit coaching of body posture, perception (where does the pressure come from?) and zonal rules of positioning for all players (create a regular question), perhaps change the amount and positioning of goals for an implicit effect on understanding how to use the body as shield or enhance repetition implicitly through line goals on the pitch or allowing only certain players into specific zones or using third man mandatory to evade the problem. Perhaps the player protects the ball in the wrong moment (dribbles when he can not, doesn’t when he has space). Through conditioned touch rules (if dribbling is possible, more touches are allowed; if not possible, only two touches maximum) we might enforce better decision making due to making the amount of mistakes made in each action clearer. Perhaps the speed is a problem as there is too much time between two touches leading to dispossession. Time rules in possession or minimum amount of touches before finishing in small sided drills and/or explicit motivation, design of the field (size, shape) could all be helpful. Is the player dribbling into the wrong direction? Maximum amount of touches allowed before finishing in small sided drills or changing position of goals on a bigger pitch, extra points for playing through zones before finishing or reaching goal area could help to enhance him – besides explicit coaching or video analysis. In a very individualized approach you could give different rules to different players with different problems. Adding coaching points for perception (scan in your back and towards the oppositional goal before you receive the ball) into that and you might see improvements fairly quick. Is the sheer execution the problem? Force them to more dribbles through line goals or minimum amount of touches or lessen the amount of opponents (from 4v4 to 1+1v1) while maintaining an holistic approach and reflecting which part is the hindrance to a functional execution. It’s important to include not only move-actions, but also think-actions – to stay in line with the terminology from Jan Tamboer’s book. For players and coaches the above quote is important and ties in nicely with the quote by Obradović. By having a reference what to do, correcting errors through the S/T components properly as talked in the paragraphes before and knowing their individual and team mates’ functions the team becomes more anticipatable. Teaching the players what they could anticipate of their team mates, the opponent and themselves, creating situations in which they know what they can anticipate and manipulating thus is very important. Lately I have tried to research a bit decision theory in football. I guess most know about the Prisoner’s Dilemma as an example of a game analyzed mathematically in game theory. Football is obviously very special and complex in regards to this as you have a lot of team mates and a lot of opponents that can intervene, two goals in the same time (score a goal – do not concede a goal) that are connected to one ball that all of the players on the pitch want. In some situations as an player („I“) you do not care if your opponent and if your team mate know what you will do. An extreme example could be a player running towards an empty goal – or Messi in general (just kidding). Generally if your advantage is so big that the opponent can not intervene and your team mate does not need to help you for the opponent not being able to intervene, this would be the case. On a general level I would call this „reactive“ – the player sees an advantage already existing and does not need to create it nor a team mate. The proposed action is to just do the action. In some situations the player („I“) does need his team mate knowing what he’ll do but does not care if his opponent does. A well played 2v1-situation on the pitch might be such an example. On a team level I’d call this an „active“ style. The main intention in both these situations for „I“ is to just do the action. But what if „I“ want to do an action the opponent can not know about as it won’t work? Busquets’ fake body posture passes are an example. Busquets wants to pass to his team mate but has to pretend to pass to another team mate. This can already be tricky. He at least needs the receiver to know (if he passes into space at least) so a deception can be problematic. Here the intention is to disguise an action as it’s possible but requires no interaction with the opponent, „just“ the lack of one. If I can only do an action if the opponent does something different than he is doing, what do I do then? I might not even necessarily need a team mate for the action to work as the main goal is to manipulate the opponent for an action. A deception might be the best way to support the team’s progress towards scoring a goal. Here there is not a lack of an action by the opponent needed, but the wrong action. A body feint when offering yourself as a passing option might be an example – you won’t become free for your team mate by moving towards him, but perhaps with a deception (run into depth before dropping) it might become that way. On a team level I’d call this and the latter behavior „proactive“. The Rondo is a great drill not because you learn a ton of great movements or skill, but players learn the difference between disguising, deceiving and just doing a pass. Also Barcelona’s strength especially with the Busquets, Xavi, Iniesta and Messi core under Guardiola was this mutual understanding of each other. Also, in all these situations the player has to know if he disguises, deceives or executes for himself or for the team mate? Does he deceive so he can get open or did he recognize a team mate as passing option that his deception could enable? And if neither work – deception, disguising or execution – then it’s important to find a different action to do, primarily on a collective level. 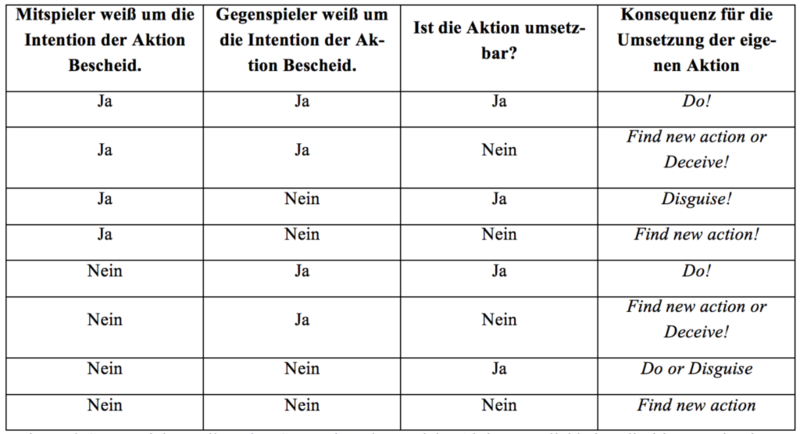 From left to right: “Team mate knows about the intention of my action” (Yes/No), “Team mate knows about the intention of my action” (Yes/No), “Can I execute the action?” (Yes/No), “Consequence for the execution of my own action”. Yet, football is not played only by the player on the ball. What if the player on the ball does not know what to do? As a coach you can give him some guidelines. Some tell them to kick it long when in danger, others give the option of a blind long line pass or diagonal chip and the most extreme tell them to hold onto the ball until a solution arrives. On a team level I’d call this a passive style of playing. Ideally the team mates would be able to recognize such a situation for the player on the ball in advance and give him a solution – through non-verbal and verbal communication. Support or Abort are the two actions in this case. Implementing this at least implicitly in the coaching is another step to go and most importantly to understand players’ problems and the own team’s game model development in fullest. With this essay I tried to share some of the mistakes I did in my coaching the last years, some solutions I thought I found and trying to give a glimpse into a project I am working on right now – a framework on football theory incl. move- and think-actions. Right now it’s fairly messy. I had 18 principles for the four actions and abandoned the whole structure soon after whilst being relatively content with the practical usefulness of most of them. Instead I am working to create a framework that incl. perceptional and cognitive aspects of football actions while giving a clearer and cleaner reference for guidelines for the four actions which seems the only thing I haven’t yet given up on. My hope is that it can become a small fundament for all coaching drills in it’s planning and also support the understanding of actions of individual players.